A Girl's Gotta Dig: Gringo legs - the best dinner in town - to go, or to eat in? Gringo legs - the best dinner in town - to go, or to eat in? The pattern of the red spotten swollen mass that is my legs changes daily, but what doesn´t change is that my ankles are no more. 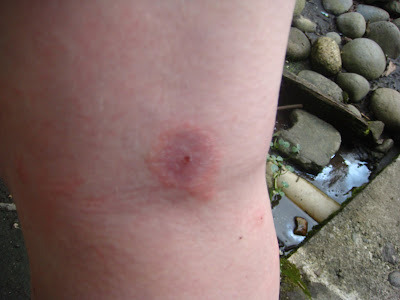 The intense throbbing itch comes and goes in waves; the result of presenting myself as fresh meat to the unconquerable bugs of the Amazonian rainforest. The larger (sand fly) bites each have a bruised radius of 2-4cm, and scratching them is blissful, if momentary release. However, I have been warned that in this humid climate scratched bites have a tendency to develop into open sores, which can then develop into more serious infections. So my will power is being tested, as just the short satisfying moment when the nail digs into the itch is such a temptation that I catch myself scratching unconsciously, in my sleep even. And then there is that one strange bite that looks different from the rest. That may, or may not, be the temporary home of a fly larvae while it grows. Well, I always did like to play the hostess. You should draw a little hotel round it with the bite mark as the front door. Was it leishmaniasis? What was the final outcome? Did you take treatments or let it go away on its own?